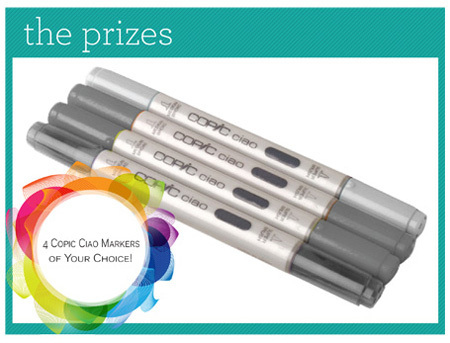 Hello Copic lovers! Happy Monday, and welcome to iCopic Weekly Challenge #27!! 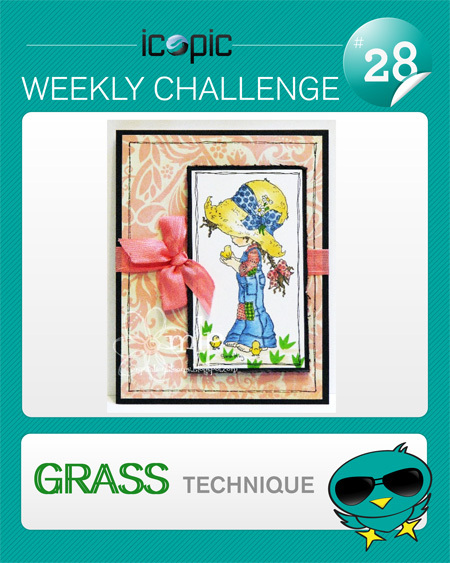 This week's challenge involves a technique: Making GRASS!! There are so many methods out there to make your own grass using Copics. If you have a favorite grass technique, I encourage you to step outside your comfort zone and use a different technique. PLEASE NOTE: International readers may participate in the challenges, but are responsible for paying for their own shipping. iCopic will let you pick the cheapest way possible for shipping your prize. All of the official rules can be found up in our new menu bar. Here are some ideas from our fabulous new Design Team!! Michelle used the side of the super brush tip to create the large grass blades shown here. For complete card details, click here! And Dana created much smaller blades of grass using the very tip of her super brush. For complete card details, click here! Now let's see what you can do! Add a direct link to your project below. Projects are due May 8th (Mother's Day!!) at noon PST (3PM EST). The lucky winner will be showcased right here on the blog on Sunday evening. Wonderful challenge - and great examples from the DT!!! Beautiful work ladies! Thanks, M! I am really proud of them! They are amazing crafters. Great challenge and fantastic examples from your dt. I had never tried grass before, thanks for the challenge! Great challenge, hope I get my card done in time. iCopic Weekly Challenge #31 WINNER! iCopic Weekly Challenge #29 Winner! Welcome to the NEW iCopic Blog!